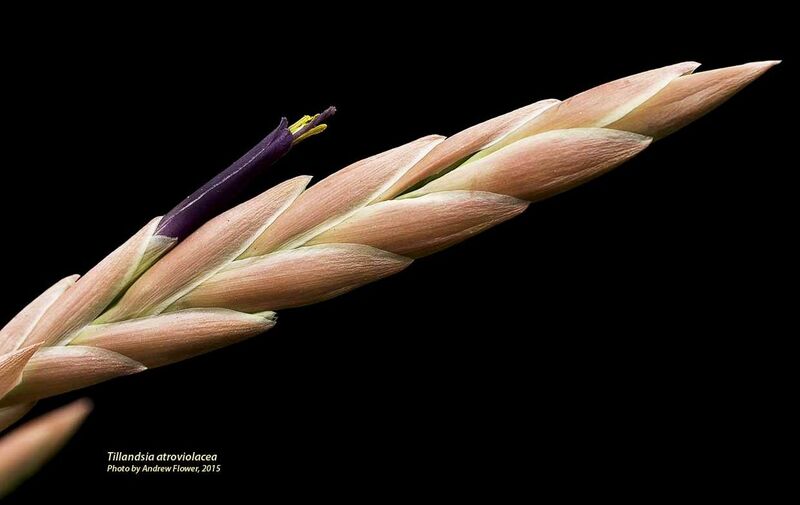 Andrew Flower ... "Tillandsia atroviolacea, originally from Chiapas, Mexico, imported from BirdRock Tropicals in 1996 (Pam's number T435). Since the plant has been here in the cold for nearly 20 years, and not exactly thriving, I treated it last August with Ethrel 48 (AI 48% Chlorethephon) at 5ml/litre to encourage blooming. If you look closely at the plant you will see that I accidentally sprayed most of the offsets as well - I left the inflorescence on the largest pup and cut them off on the smaller ones. 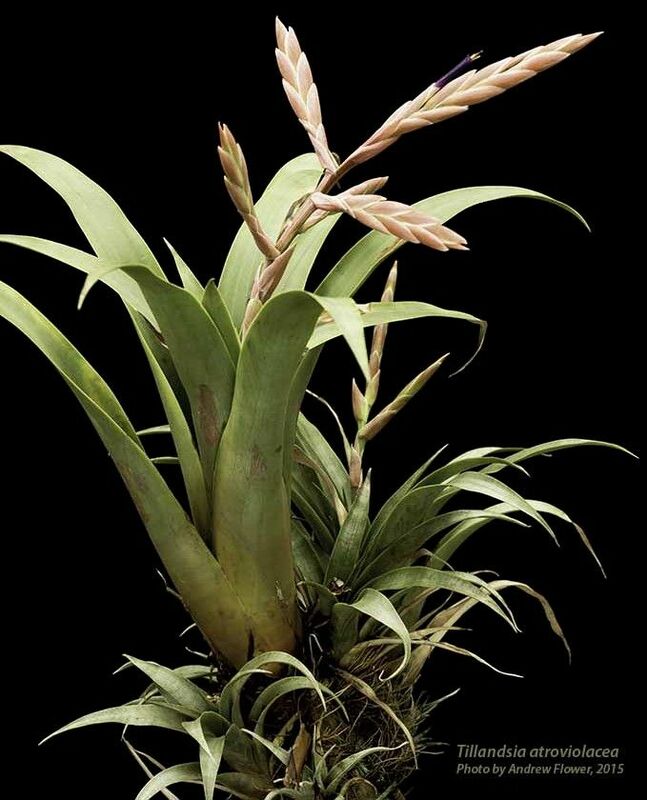 The inflorescence shows an obvious likeness to T. pamelae. Named for its almost black petals." Len Colgan ... "Andrew: That is interesting. 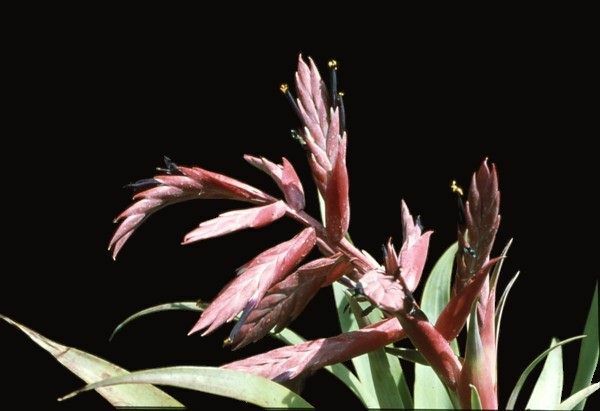 You possibly know that Renate and Pam originally named the plant Tillandsia atroflora, literally meaning "black flowers". However, Walter insisted the flowers were nearly black but with a bit of violet, and it would be best not to give the impression that there are black-flowered tillandsias. 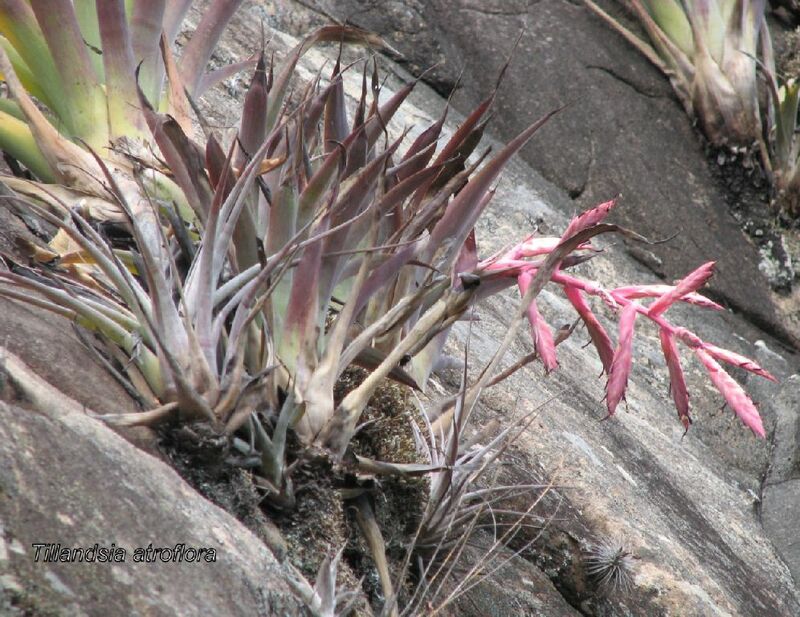 Hence, the final name Tillandsia atroviolacea. I am sure Pam will correct me if I have this incorrect. Of interest, if you look at the first attached early photograph taken by Jürgen Lautner in habitat, it shows the first suggested name. But the flowers on your plant are nowhere near as close to black as others I have seen. I also got this plant species from Pam in about the same year as you, nearly 20 years ago, but mine is yet to flower. I believe other Australians have flowered it, and might like to comment on their flower colour."